There are two measurements by which PNG Hunters coach Michael Marum is judged; games won by the Hunters and players who leave the club in search of bigger and better opportunities elsewhere. 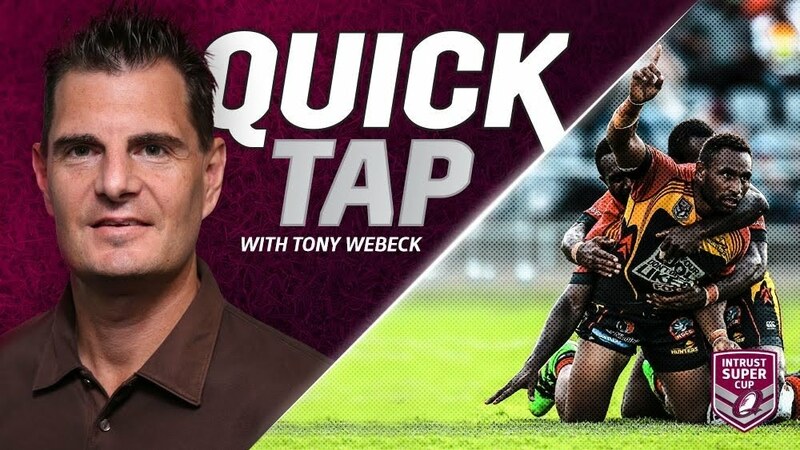 At any other club that second measurement would be seen as a negative mark against the coach, but for Marum and the Hunters, it has been the modus operandi since the club’s introduction into the Intrust Super Cup three years ago. Currently sitting in third position on the ladder, the Hunters can have a major influence on the make-up of the top six in the coming fortnight with games against Ipswich and Burleigh at Port Moresby’s National Football Stadium. Easts’ position in the top six is now precarious after a 38-8 defeat at the hands of the Hunters last weekend and Redcliffe only escaped with the two competition points the week prior at Dolphin Oval courtesy of two tries in the final six minutes. The Hunters should have little trouble qualifying for the finals for the second season in succession, but Marum’s job description extends much further than simply wins and losses. The formation of the Hunters was primarily to help raise the standard of rugby league in Papua New Guinea and to elevate the national team into international relevance once again. Marum serves as both coach of the Hunters and coach of the Kumuls and knows that the latter of those two jobs will be made infinitely easier by players graduating from the Hunters program and going on to develop their skills overseas either in the NRL or in England. Last year’s captain Israel Eliab is now contracted to the London Broncos, Willie Minoga is in the backyard of the North Queensland Cowboys at the Blackhawks, Kato Ottio is edging ever closer to an NRL debut with the Raiders and winger Justin Olam has been offered a contract with the Melbourne Storm for the next two years. Olam scored a double in the win over Easts last week to take his tally to 10 in his first season in the Intrust Super Cup and Marum knows that the Hunters’ loss next year will eventually prove to be the Kumuls’ gain. “The more local players from PNG that go and play with the NRL sides that's going to help with the national team,” Marum said. Halfback Watson Boas – who starred for the Kumuls in their mid-year Test win over Fiji – is the next Hunters player Marum predicts will come under the eyes of NRL clubs. “There are a few boys that clubs are probably talking to. Maybe Watson Boas at his age. He's still young and I think if he is given a chance he can probably compete at that level,” Marum said. Titans fullback David Mead captained the Kumuls for the first time in May and having been disillusioned with the governance of the game in PNG previously is now excited about what the Hunters program has been able to achieve in not only winning games, but providing local players with a genuine opportunity to better themselves. “There are a couple of players that have been signed by NRL clubs through the Hunters system so I think they’re doing a pretty good job developing players over there and making sure they meet standards of the training requirements every week,” Mead said. “Obviously the players are doing that and being rewarded with contracts overseas. Which would mean that Marum has to go searching for even more local talent to play for the Hunters in the Intrust Super Cup next year.